15 April 2014 [updated with December 2014 survey results]. Article by Karl Fjellstrom, for ITDP. 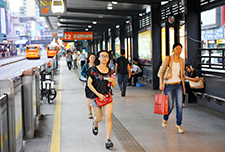 BRT impact analysis surveys in Guangzhou show a huge improvement in the walking environment since the BRT was implemented. Before the BRT, 38% of pedestrians interviewed along the BRT corridor rated the walking environment as 'bad' or 'very bad'. Only 23% of pedestrians rated the walking environment as 'good' or 'very good'. 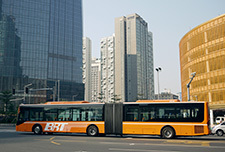 The BRT opened in February 2010. In the first set of Winter surveys after the BRT opened, in December 2010 (the August 2010 figures are from Summer, when the heat means walking conditions are generally poorer), the numbers had dramatically reversed, with 74% rating walking conditions as 'good' or 'very good' and only 6% rating it as 'bad' or 'very bad'. In subsequent surveys the rate of satisfaction has maintained high levels, with 71% satisfied with the walking environment in December 2013 (67% in December 2014) and only 3% rating it as 'bad' or 'very bad' (10% in December 2014). Meanwhile in a non-BRT corridor used as a control survey, satisfaction and disatisfaction rates with the walking environment did not change significantly. Before the BRT, pedestrians in the non-BRT corridor were much more satisfied than pedestrians in the (future) BRT corridor, with a satisfaction rate of more than double: 47% in the non-BRT corridor compared to only 23% in the BRT corridor. In the period since the BRT opened satisfaction in the control corridor has increased to 56%, but it is far below the BRT corridor satisfaction rate of 71%. The BRT led to huge improvements in the safety and convenience of crossing the road, since most stations have safe crossings at each end. This is a stark contrast to the situation for pedestrians crossing the road before the BRT, as shown in the photo below. Before the BRT many walkways were blocked by people waiting for buses, making it difficult to walk, as seen in the photo below. 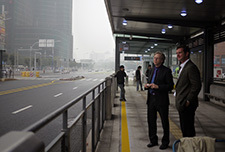 After BRT, this was no longer a problem, as people wait for buses in the BRT stations in the centre of the roadway. The chaotic and congested situation before the BRT meant that the roadway was noisy and unpleasant. 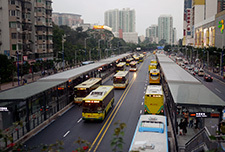 After the BRT traffic flow greatly improved, resulting in less honking, less stop-start traffic, and a generally more pleasant environment. Station area improvements have been made at several locations along the BRT corridor, including conversion of setback parking into attractive and popular public plazas and small linear parks. Land uses have changed along the BRT corridor, and new shops are being installed as the high quality walking environment attracts retail investment. 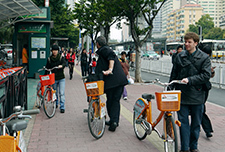 These shops in turn further enhance the activity and appeal of the walking environment. 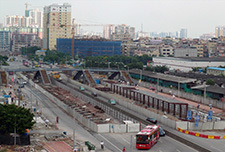 The BRT stations are accessed by a combination of bridges, tunnels, and street level crossings. The BRT bridges are much better for pedestrians than the previous footbridges. All are now covered except for one pre-existing bridge, and the main stations include escalators. 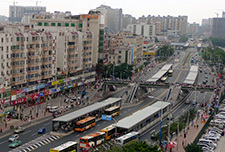 All of the previous footbridges were demolished and replaced with new BRT bridges, except for one bridge at Huajing Xincheng which has lifts installed and was retrofitted with ramps to access the BRT station. The example of Gangding is shown below. 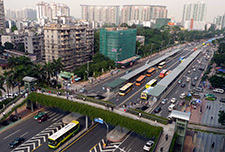 The BRT corridor designs incorporated high quality walkways as part of the BRT project, since the walkways were within the design scope of the project. However, the new walkways were already completed at the time of the December 2009 surveys, when dissatisfaction rates were still high, so this does not appear to be the major explanatory factor. Safe street level access to the Chebei BRT station along Zhongshan Avenue. 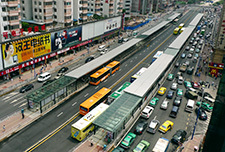 The pedestrian environment at Tangxia along Zhongshan Avenue before the BRT. 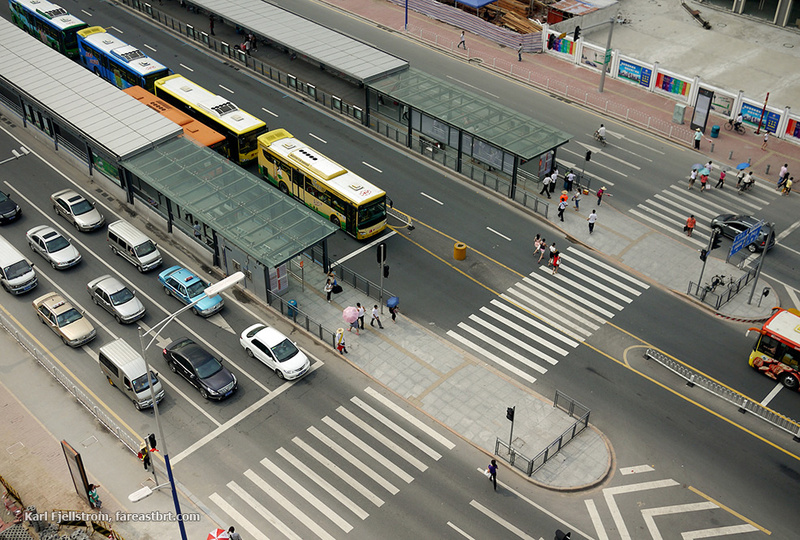 The pedestrian environment at Tangxia with the BRT has been greatly improved. Note the covered footbridge with escalators, the lack of conflict with waiting bus passengers, and the street-level BRT station access provided in addition to the bridge. The footbridge at Gangding before the BRT. 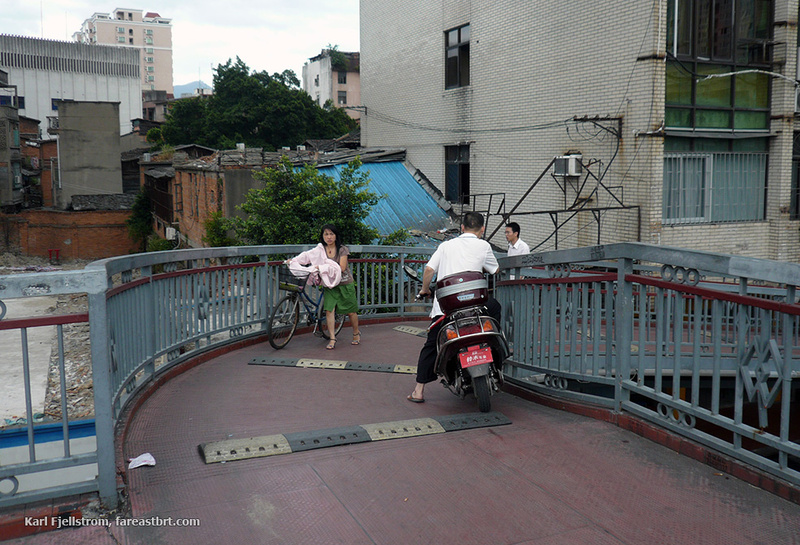 The footbridge for street crossing and BRT station access at Gangding includes cover, 10m in width, and escalators. For the results outlined above, between 308 and 417 pedestrians were surveyed by ITDP along the BRT corridor in each of the periods listed. 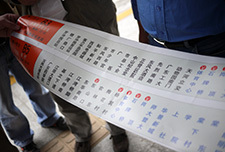 In the non-BRT control corridor, between 221 and 290 pedestrians were surveyed.